Hot damn, French filmmaker Luc Besson has found some kind of second filmmaking wind. He's keeping up with everything, developing more and more, not only producing Taken 2, he was already in the news earlier today casting a "darkly comedic gangster thriller" titled Malavita that he's directing next. In addition to that, Variety is now reporting that Besson is already setting up another project to writer & direct, this one an adaptation of a Gallic comic book series called Valerian, published in Pilote. EuropaCorp is developing the adaptation about the adventures of space and time traveling agent Valerian and his sidekick Laureline. Besson, who said he was retiring from directing years ago, is back at it again. He just finished The Lady last year, now he's gearing up to shoot Malavita with Michelle Pfeiffer and Tommy Lee Jones, as well as some other untitled film with Angelina Jolie, in early 2013. Then it sounds like he'll move to Valerian, all with EuropaCorp, being written & directed (in English) by Besson. Those are the only details so far on Valerian. Valérian and Laureline is a French science fiction comics series, created by writer Pierre Christin and artist Jean-Claude Mézières. First published in the magazine Pilote in 1967, the final installment was published in 2010. The series focuses on the adventures of the dark-haired Valérian, a spatio-temporal agent, and his redheaded female companion, Laureline, as they travel the universe through space and time in the 28th century. Valérian is a classical anti-hero, kind-hearted, strong and brave but with a tendency to follow the orders of his superiors even if he feels, deep down, that it is the wrong thing to do. I'm sure Besson has some angle to this to make it a cinematic story; I hope he's getting back to his sci-fi roots (e.g. The Fifth Element). 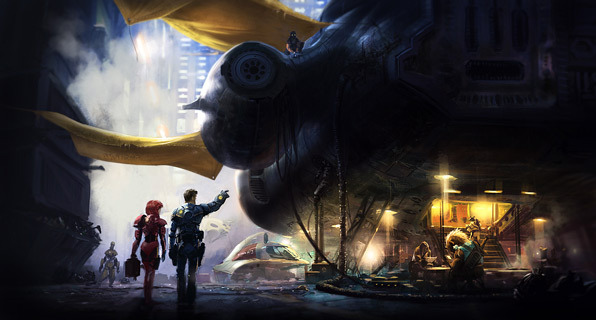 Check out this concept art I stumbled across for Valérian and Laureline, created by Jan Ditlev Christensen, completely unrelated, but a cool look at the potential of the world this story exists in. I'm intrigued already! This is such incredible good news!!! Hurray! Luc Besson for President!!! This could be a real good sci-fi franchise if it's done right. I'm hoping Besson will go for the space opera, hollywood blockbuster style when adapting this. My favorite as Valerian would be Jake Gyllenhaal, and as Laureline, Alicia Witt. I would rather see a sequel to his comic-adaption of Adele Blanc-Sec.